Update: in light of the recent harsh editorial board Op-Ed by the National Review, and Rich Lowry, against Marco Rubio’s immigration Plan we recommend you do your job too to help Sen. Rubio. Get involved call your Senator and Congressperson. If you really think Latino are the only option for GOP, then help Rubio Help you on immigration. The NR was behind Prop 187 in California , they were again President Bush’s immigration Plan , they were in favor of SB1070, they were against the polices the “Texas Dream Act” passed by a Republican legislature. In short, they have a record of supporting bills that have created so much tension between the GOP and Latinos. I wholeheartedly agree with Gov. Bobby Jindal when he argues that it is time to “end the dumbed-down conservatism” to woo Latino voters. But apparently the National Review Magazine has not gotten the memo and its editorial board opts to keep fomenting misconception about Latinos, both Immigrants and native. Some of my Mexican-American fellow Republicans legislators , or Latinos, do not think the issue of immigration will be part of a struggle for power within the GOP. They like to pretend that this issue only affects immigrants. They therefore, fail to take the lead on the issue. However, if you read the National Review arguments, this is not only about illegal immigration, but rather about the stratification of the entire Latino community as government “takers,” immigrants, and natives alike. So now that the number of ‘invasion” no longer matches since illegal immigration is at its lowest in 40 years, the NR now perpetuates the myth that all Latinos are government takers, and therefore, they aren’t natural Republican voters. What is the common thread uniting McCain, the advocate of “comprehensive” immigration reform, and Romney the advocate of “self-deportation”? They are both Republicans supporting conservative economic policies. Surely, that had more to do with their showing among Latinos than anything they did or didn’t say about immigration. Native-born Hispanics, 50 percent of all households with children are headed by unmarried mothers. About 40 percent of all households receive benefits from a major welfare program. This doesn’t mean that the GOP shouldn’t try to appeal to voters in these households. It does mean that they aren’t natural Republican voters. As a result, Lowry suggests that anybody enrolled in any government program is an unlikely Republican voter. However, he fails to mentioned that about 70% of all households in America receive government benefits, and therefore, 70% of household in Americans “aren’t natural Republican voters,” in following Mr. Lowry’s logic. Furthermore, Medicare and Social Security are the main drivers of national debt and depict with about $2 trillion annually. 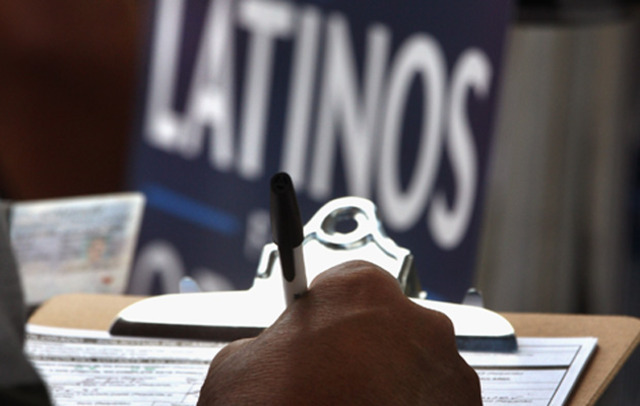 However, only 8% of enrollees in these programs are Latinos while 80% are “white.” And since Medicare and Social Security enrollees pay only about 38% of the benefits, it also means that all senior enrollees in these programs “aren’t natural Republican voters” since in reality they receive more government assistance than they pay for. And these are facts easy to show in Nicholas Eberstadt’s new book “A Nation of Takers: America’s Entitlement Epidemic” where he argues that in the 1960s entitlements cost was only $16 billion but now Entitlements cost is $2.3 trillion, driven mainly by Medicare and Social Security benefits. But these are facts that Mr. Lowry does no incorporate in his Op-ed; in his mind only Latinos who get a type of government programs are ineligible to become Republicans. Moreover, unmarried mother and blue-collar Latinos are not the only groups of voter who use government medical programs but vote Republican. For example, the only group of voters Romney made gains in this election was with “white” voters, but those white voters happen to be blue-collar workers that reside in poor states in the south. If we look at the states that voted solid for Romney—more than 60% –they are all in South, which happens to be states with the biggest poverty rates in nation. According to US Census, chronic poverty in the south has increase in the past two years, and thereby, making white resident in Southern state more dependent on welfare programs. Yet they keep voting Republican overwhelmingly. So poverty is not a condition that prevent voters from voting Republican since poor whites is south are prone to be poor and enrolled in government programs more than Latinos in states like Texas, Colorado, or California. In essence, and following Lowry’s logic, the poor white Southerners shouldn’t be natural Republican voters” either since they get government benefits. So evidently this is careful attempt by Lowry to stratify, or stigmatize, of a class of people—Latinos–by scaring white voters by discrediting Latinos just because they support an immigration reform. How much of the Latino vote did Reagan get? In his 1980 landslide victory, 35 percent. In his 1984 landslide victory, 37 percent. That’s better than Romney, but still a wipeout. Reagan supported an amnesty in 1986. What did it do for the party’s standing among Latinos? George H.W. Bush got only 30 percent of the Latino vote in his own landslide victory in 1988. Coincidentley, Mr. Lowry cites numbers from 1988 in Texas to show that only 30% of Latino voted for Bush, but avoids mentioning that in the 80s, half of Texas was still a Democrat state where the policies of LBJ’s War on Poverty and FDR where still part of the state mantra, especially in rural areas. A large share of white voters in Texas, 43%, also voted for Michael Dukakis. But Mr. Lawry sees only Latino voting Democrats as a type cultural defect that leads to government dependency, whereas he perceives poor southern voters folks as “real American”, even if they are on welfare. Moreover, Mr. Lowry deliberately fails to mention that in 2004, Latinos voted for President Bush by 44%. Thus, with all the intellectual might and prestige of The National Review, Mr. Lowry omits empirical voting data to purposely exposed his readers to the same old prejudice and myths that Latinos voting democrats is the only way to secure you free goodies. Lowry also points out that Latinos in California will never vote Republican in larger numbers than than 30%. But he forgets that 44% of Latinos in California voted for Arnold Schwarzenegger in 2006. Or that 52% of Latinos voted for prop 8, proposition that banned gay marriage. If indeed the 30% threshold that Lowry uses as a predictor for Republican voters, he should argue that Jewish voters ‘aren’t natural Republican voters since only 25% of Jewish-Americans vote Republican consistently. So why isn’t Mr. Lowry arguing that Jewish voters ‘aren’t natural Republican voters? Does he fear Jewish donors, or the Evangelicals? Republican donors with a disproportionate influence in the party would be perfectly happy to jettison the cause of immigration enforcement. They are fine with a flood of low-skilled immigrants competing with low-skilled American workers. And why shouldn’t they be? These immigrants don’t suppress their wages; they care for their children and clean their pools. Thus, any Republican who may support an immigration reform does so to obtain cheap labor. Conceivably, Mr. Lowry has to pander to his readers, and just like Mitt Romney who blamed the voters, play on their fear that Latinos voters are inherently people that are fond of government programs. But if he is to apply his own logic that Latinos vote democrat because they receive some type of government assistance, and therefore are unlikely to be Republicans, he needs to fairly point out that there more government monies going to middle-class seniors in the form of entitlements, and there are more poor whites in the Southern red states who get benefits. Too, his magazines should stop the “dumbed-down conservatism,” as Bobby Jindal called it, since his magazine is the premier magazine that seems to spread myths and the scapegoating of Latinos since the early days of Prop. 187 in California. Moreover, the National Review is the only publication still insisting in portraying the culture of Latinos as unfit for Americanness, like John O’Sullivan, who writes that “immigration, by increasing diversity, slowly frays the social fabric.” Or like Andrew McCarthy— Immigration & Delusion— who in a truly unhinged column compares “Hispanic activists” to Islamists. Or Mark Krikorian who argues that a more moderate stance on immigration will attract fewer Hispanic voters than it will lose white voters. Therefore, those like the National Review, will continue to oppose the new strategy plan for an immigration reform by the GOP, if any, are the very same publications that for the last 20 years were the main supporters of 187 in California and SB1070 in Arizona; they like to live in their own cocooned universe where only their own facts matter while avowing real data. Consequently, the most treacherous agents to the Republican Party to win the White House are the National Review and its writers who keep perpetuating myths about illegal immigration and Latino voters. Mr. Lowry argues that amnesty is just a fantasy to get the Latino vote, but clearly he lives in his own fantasy bubble cocooned from reality that the Electorate is changing. Alex Gonzalez is a political Analyst and Political Director for Latinos Ready To Vote. He received a Bachelor Degrees in and a Masters’ Degrees, with emphasis in American politics from San Francisco State University. 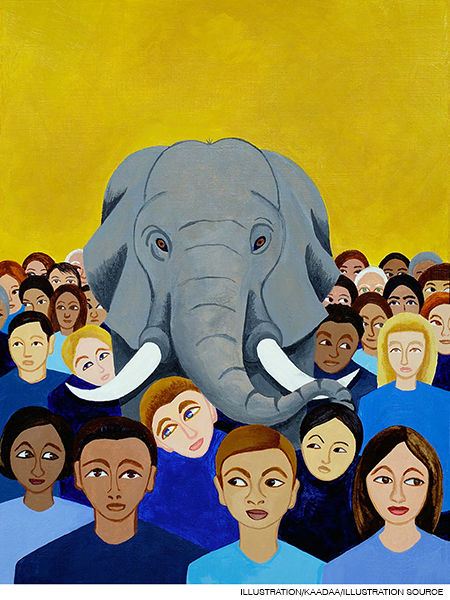 The Elephant in the Classroom: Why is diversity so hard to manage? How can we educate, Latinos on this issues? Since the media will always lie! Univision in spanish right out lies, changes stories.